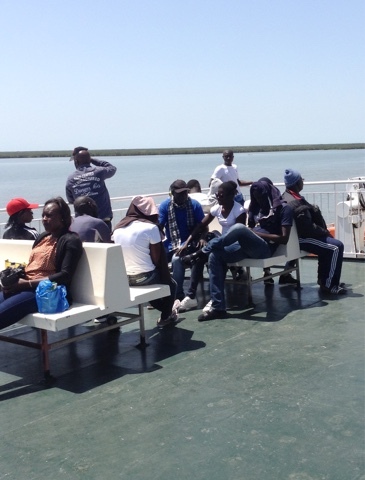 I had several prolonged spells of nervous suspense as I awaited the departure of the overnight sixteen-hour ferry from Ziguinchor to Dakar. The first was whether I would even be aboard. 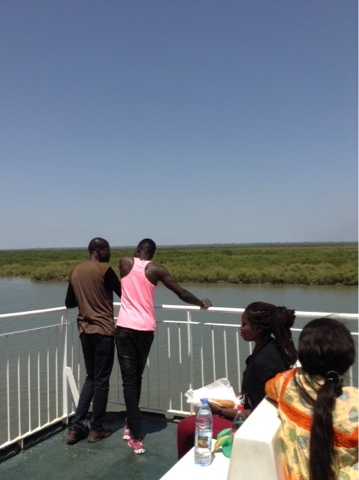 I had originally booked a ticket for the Sunday ferry, but when I spent less time in Guineau-Bissau than I anticipated, I tried to change my ticket to the Thursday ferry on the Monday before its departure. I was told all the cabins had been booked, but I could have a chair, without however being refunded the difference in the cost. The ticket sellers were taken aback that I was agreeable to that. They said there was a good possibility that there would be a cancellation, but I would have to leave my ticket with them so they could change it when it happened. That seemed a little risky, but I had no reason to think it was a scam, so I left my ticket and headed off to Cap Skirring for a couple of days. I was told to return to the ticket office at ten a.m. on Thursday, three hours before the ferry was due to depart. I was back in Ziguinchor by nine a.m. after camping nine miles out of town in a palm grove. Rather than heading straight to the ferry terminal, I bought a bag of baobab juice to pour over my remaining cornflakes and plopped down in the shoddy town park for some breakfast. Rare was it to find a town park let alone a bench, so even though it was as unkempt as an unmade bed, it provided a nice refuge from the general hubbub. When I arrived at the ferry terminal a little before ten it was already aswarm with passengers lined up to board and another mob in front of the ticket office. I regretted not coming directly to the ferry at nine. It looked like I was doomed to the Sunday ferry. I went to the front of the line outside the ticket office to see if I could catch the eye of the ticket-seller who I'd left my ticket with. She was blocked by a cluster of customers and a pair of security guards at the door. The guards took my name and added it to a list of nine others and was told to take a seat until I was called. Not a single name was called for ten minutes. It was looking worse and worse. Then at 10:15 one of the guards suddenly had a handful of tickets and was calling out names. I joined the crowd around him to peer at the names on the tickets in case he had trouble pronouncing my name. As he fanned them out I could see my name on one of them. I was saved. I wanted to go inside and give the ticket agents hug of thanks, but that wasn't possible. I had already been imformed that I would have to check my bike and not roll it on to the ferry as I ordinarily do and was even able to do on the Queen Mary this past summer. I couldn't stop making comparisons to that most orderly of processes and this semi-chaos. I was a bit leery about leaving my gear on my bike, but had been told I had no choice and that it would be safe. I did take off the two front panniers and transferred my more valuable items to them and carried them on to the ferry. Except when I boarded I was told that since I was in a cabin with eight there was no room for luggage and I would have to check it. If I had opted for the more expensive four or two person cabins, I could have brought them on. The guy checking was distracted by my panniers so didn't notice the pack I had on my back with my food and water and extra clothes, so I was at least able to smuggle that aboard. The same thing had happened at the security check. The guard looked through my panniers, but not the pack on my back. He asked if I had a lighter. There was a big pile they had confiscated. There were a handful of French tourists among the passengers but none in my cabin. I was assigned an upper bunk by the window. There was one older couple and five single guys in our tight little cabin. There was a shower down the hall, a tiny restaurant and a bar. There were three levels where one could sit outdoors--one unshaded on the upper level, a slightly shaded alcove at the stern with the bar and then below it a narrow rim with no seating. Most people crowded on the middle level. The best viewing was on top, if one could tolerate the sun. I was aboard by eleven. After making a circuit of the boat I noticed my bike parked behind the ferry off to the side on the other side of a barrier from four motorcycles and another bike. I stood at the railing for two hours waiting for it to come aboard. When it was brought aboard I was going to run below and ask if I could reattach my front panniers, so at least all my gear would be in one place. When it hadn't budged fifteen minutes before one I went down below and asked about my panniers. They said I could put them on the bike. When I tried to bring the bike back with me I was waved off, but at least I had asserted the presence of my bike so it wouldn't be forgotten. 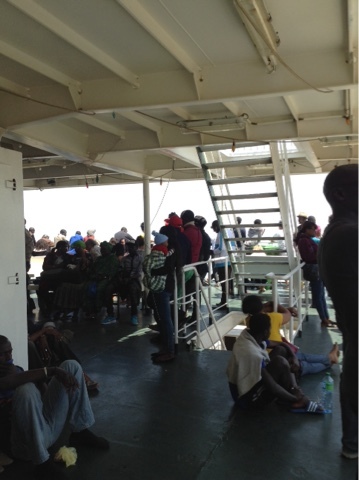 At one o'clock, our supposed departure time, the attendants began driving cars onto the ferry, just ten of them. It was encouraging to see there were so few and no trucks. The predecessor of this ferry had sunk at sea over a decade ago, partially because it had been overloaded. It was a major disaster with all aboard perishing. 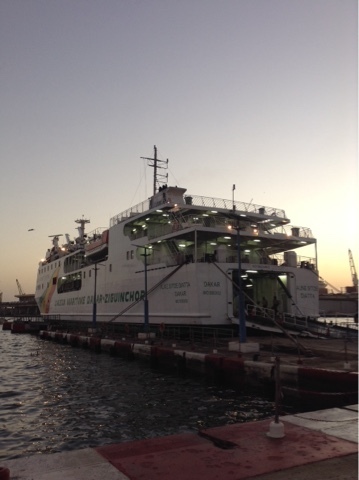 Unlike the train from Dakar to Bamako that had been discontinued after a succession of accidents with fatalities, the ferry was allowed to live on. I had been told there was a memorial to the victims at the dock, but no one there knew anything about it. It was a relief to see my bike wheeled aboard, the last of the vehicles. Our first three hours were down the Casamance River before we reached the Atlantic and headed north to Dakar. Lush green vegetation lined the river and continued as far as the eye could see. Before we reached the ocean we stopped at a small village and took on a few more passengers. It had been calm going, but once we went out into the open sea a little after five the ship went into a slight roll. So much for sitting on the deck for me. I needed to lay down. I don't know if the seas calmed as I was quickly asleep and was pretty much out until we arrived at Dakar thirteen hours later. I was only aware of my legs soaking up the rest. I heard a brief spurt of light snoring, but it didn't amount to much. I was sorry to miss the sunset out over the ocean, but I was also happy for this much needed sleep. It was dark when we arrived in Dakar. Passengers were allowed to linger on board until it began getting light at seven. 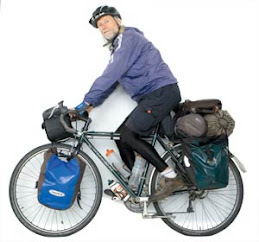 When I exited the ship at 6:45 I saw my bike just ahead with all panniers and gear attached--a most happy site. I kept remembering the friend who flew to Cuba with his bike and had it stolen from the airport before he had a chance to ride it. I had been in a momentary panic before I boarded the ferry when I was ushered to a window further away than I realized to pay for my bike and left behind my two panniers. There was a cluster of people milling about in the chaos of the terminal any of whom could have grabbed my unattended panniers sitting in a corner near my bike. In Cuba that most likely would have disappeared. Here my concerns were unfounded. The ferry docked at the same dock as the ferry I had taken to Île de Gorée, so I knew the way to the hotel I had stayed at when I arrived. I wasn't going to check in, but I wanted to check to see if it still had my bike box. I wasn't able to lay eyes on it, but I was assured it was in a safe place. That didn't leave me fully placated, but all my ferry anxieties were a waste of energy, so I will try not to worry much in the next ten days before I return for it. In the meantime I'm off to the northern extremity of Senegal after just being at its southern. It's 170 miles to the UNESCO World Heritage city St. Louis, West Africa's first French settlement, and the border with Mauritania. 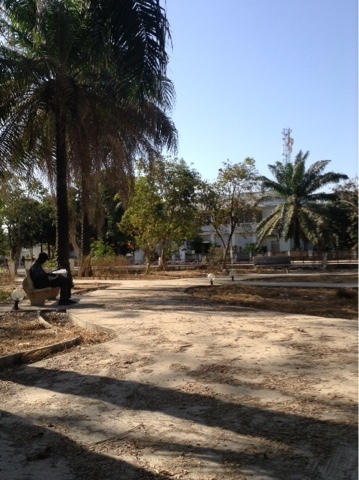 It is cooler, in fact cool enough upon arrival in Dakar to need a wind-breaker, at least in the early morning hour. Hi George I just got into New York. Very cold, snowy and windy. Thanks for your bloggs. I'm only in USA for 5 or 6 weeks then back to mali till film.